What is XREF | XREF Publishing Co., Inc. The XREF “HVAC” Encyclopedia is the largest unbiased cross reference and model number database specifically designed to help you find replacement HVAC/R parts and suppliers. Our software features high speed look-up capabilities with more than 1,300,000 records containing over 3,000,000 part numbers. The XREF “HVAC” Encyclopedia is the only unbiased, comprehensive cross referencing database for the North American HVAC/R industries. Within our databases you’ll find part numbers for controls, compressors, motors, fan blades, blower wheels, heaters, sensors, contactors, elements, gaskets, v-belts, relays, thermostats, valves, coils, tools, supplies, refrigerants and other chemicals, and much, much more. The XREF “HVAC” Encyclopedia contains over 1,300,000 primary manufacturer/OEM numbers and at least 3,000,000 secondary numbers. 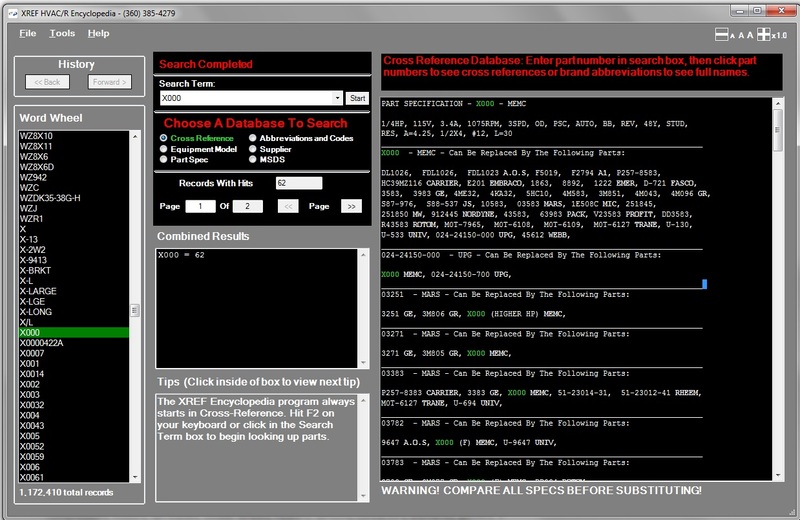 XREF databases represent more than 1,000 manufacturers. The “HVAC” Encyclopedia is essentially a compilation of all the major wholesaler and manufacturer catalogs. HVAC model number to OEM number cross reference for more than 140,000 models. Commercial Icemaker model number to OEM number cross reference for more than  2,000 models. Model number cross reference to OEM number by description of component. Cross reference to the brand of user’s choice. Cross reference by specifications for motors, compressors, capacitors, fan blades, blower wheels, and contactors. Cross references by: OEM to OEM, OEM to aftermarket, aftermarket to aftermarket, aftermarket to OEM. Your staff will quickly master the power of XREF. Most searches are completed in under 5 seconds. Compare that to searching paper catalogs or multiple manufacturer-supplied lists. XREF is the only unbiased source of information. XREF Publishing Co., Inc. does not sell any parts, controls or tools. We simply report who is selling what throughout the North American HVAC/R industries. The XREF “HVAC” Encyclopedia includes many rare, hard-to-find, and specialty items as well as historical data that will enhance the service you provide your customers. The XREF “HVAC” Encyclopedia is costing you $ 3.83 per day based on a 5-day work week. By empowering your employees with XREF, you will enable them to use their time more efficiently and increase your sales, thus resulting in an increased profit margin. The cost of XREF is minimal compared to benefits it brings your company. How many employees do you know who have an instant and accurate knowledge of over 3,000,000 part numbers for the HVAC/R industry? How much would you have to pay for one if one was available? XREF “HVAC” Encyclopedia updates are released twice each year. The two updates are mailed around June 30th and December 31st.